How to Fillout GST Return Online for e-commerce business. 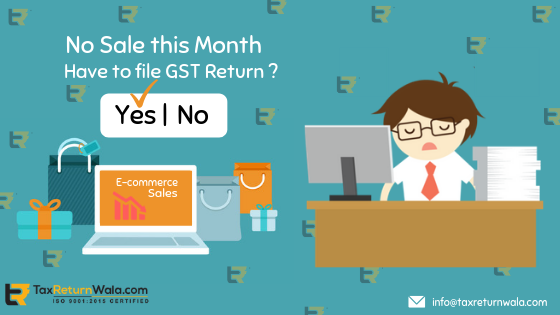 Is it compulsory to fill out the GST return every month with no sale done in an e-Commerce business? Yes, in normal course if you are a registered applicant of GST for e-commerce business then you have to compulsorily file a ‘nill return’ of every respective month in which no sale was made. GST is a single tax structure which inclines every registered or person liable to register, to pay a certain amount of tax to government for every sale or supply of goods or services made specified in the GST law in a specified period, irrespective of the fact that business is operated in an online or an offline mode. Also, for a registered taxpayer under GST, it is necessary to file a GST return either monthly or quarterly irrespective of the amount of sale/supply made. Who can apply GST for e-commerce? Every person who directly, indirectly, owns, manages or operates an electronic platform, engaged in facilitating the supply of goods and services can apply for registration of GST for e-commerce business (Section 24). The said person registered will be identified as an e-commerce operator. If you are an e-commerce operator, then as per GST rules, it is mandatory for you to get registered under GST irrespective of any threshold exemption limit. And, for return filing, GSTR-8 form is to be submitted every month by every registered applicant who’ve applied GST for e-commerce. Also, the operator has to file an annual statement of returns filed by 31st December following the end of the financial year in which tax was collected. As per law, every e-commerce operator has to pay 1% of TCS on all goods and services sold through their platform. GSTR-8 is an online GST return form which is filed by every registered taxpayer who’ve applied for GST for e-commerce and is required to deduct TCS (Tax Collected at Source) under GST. GSTR-8 is filed by providing all required details of supplies made through the e-commerce platform. The return form also supplies details to the department of the sum amount collected as TCS by the e-commerce operator which can later be viewed under Part-C of GSTR-2A. To file GSTR-8, it is necessary for the taxpayer to hold both GST registration as well as TCS registration. What does GSTR-8 comprise of? 1.Table 3 for filing details of Supplies attracting TCS. 2.Table 4 for correction of incorrect details filed in the last filing period. 3.Table 5 including details of interest penalty in case of late filing. 4.Table 6 and 7 for payment of tax. What is the due date for filing GSTR-8? GSTR-8 is to be filed by the 10th of the month succeeding for which the return is to be filed. For example, GSTR-8 for August is to be filed by 10th September. Is an option available to revise GSTR-8? No, GSTR-8 cannot be revised once submitted. But the error can later be rectified in the next return filing period in which the error gets identified. What will happen if GSTR-8 is not filed? As per CGST Act 2017, non-filing of GSTR-8 by applicant of GST for e-commerce, a penalty of Rs 200 per day (Rs 100 CGST and Rs 100 SGST) would be levied up to a maximum of Rs 5000/-, after that interest rate of 18% will be charged for the period from the date of filing till the date of return actually filed. No penalty has been specified for delayed filing in case of IGST.